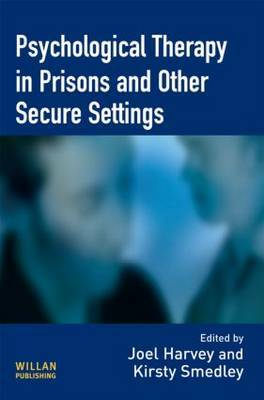 This book examines a range of therapeutic approaches used in prisons and other secure settings and explores the challenges in such work. The approaches include Cognitive-Behavioural Therapy (CBT), Cognitive-Analytic Therapy (CAT), Attachment-Based Psychodynamic Psychotherapy and Systemic Psychotherapy. It provides insights into debates about providing therapy in prisons and other secure settings and discusses specific topics such as mental health in-reach teams, working with women in prison, therapy within therapeutic communities and therapy with black and minority ethnic groups. This book addresses developments in mental healthcare by the National Health Service (NHS) within prisons and on-going policy developments which aim to improve access to psychological therapies for prisoners. The contributors draw on experience both in clinical psychology and forensic psychology, as well as psychotherapy and criminology. They draw on experience too in a range of environments, including juvenile and young offender establishments, local prisons and dispersal prisons. Psychological Therapy in Prisons and Other Secure Settings will be essential reading for people who work to improve the psychological wellbeing of individuals in prisons and other secure settings.